New Xbox 360 to spoil PS3 launch? Could a new 'Premium' Xbox pack include the HD DVD drive as standard? As Sony's European PlayStation 3 launch on March 23rd draws closer, rumours have again resurfaced about Microsoft hiding a revamped Xbox 360. If we continue to stir the gossip pot with a giant spoon, we might also believe that the low-grade 'Core' Xbox 360 pack will be cancelled, and the 'Premium' pack will benefit from a price drop and include the external HD DVD drive as standard. 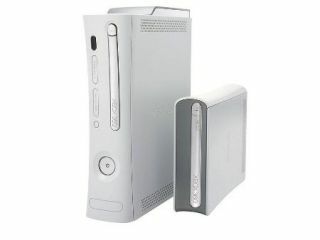 It would come as no surprise if Microsoft released an upgraded version of its Xbox 360 console. The Core and Premium packs were launched in the UK at the end of 2005 and are now ripe for an update. According to German website Xbox-Archiv , the potential PS3-spoiler, known as 'Zephyr', will be matt-black, feature an HDMI connection, and herald the launch of a roomy 120GB removable hard disk. Such an upgrade would easily bring the Xbox 360 up to spec with Sony's PlayStation 3. And, by pricing the version 2.0 console around the PS3's £425 mark, Microsoft would hope to strip away Sony's remaining technical advantages. Microsoft already has a vibrant online community, more games and better computer connectivity than the new PlayStation. The PS3 launch date on March 23rd might be too early to roll out such a new machine. But there's a distinct possibility that Microsoft might hijack Sony's big day by announcing a well-timed price drop. A price of 299 Euros has been mooted - that's just over £200 in GBP. Of course, what Microsoft won't want to do is alienate its existing Xbox user base - over 10 million people worldwide now own one. So if the Zephyr exists as a production model (and Microsoft isn't saying) then it's simply an evolution of the current Xbox system, rather than a whole new bit of kit. A version 1.5. With the Euro PS3 launch date looming, you might want to wait for a week or so if you're thinking of buying a new console. Let Microsoft play its hand. It might have a surprise or two in store.